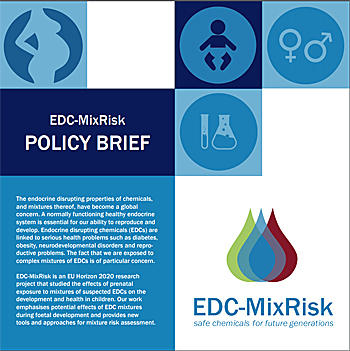 A project focusing on the effects of mixtures of endocrine-disrupting chemicals on children – EDC-MixRisk with the ultimate aim of promoting safer use of chemicals, issued their press release last month to alert the public and policy makers across the world to the human health risks of chemicals in our environment, in our food, and in our clothing. The endocrine disrupting properties of chemicals, and mixtures thereof, have become a global concern. A normally functioning healthy endocrine system is essential for our ability to reproduce and develop. Endocrine disrupting chemicals (EDCs) are linked to serious health problems such as diabetes, obesity, neurodevelopmental disorders and reproductive problems. The fact that we are exposed to complex mixtures of EDCs is of particular concern. Current risk assessment and management practices, however, focus mainly on exposure to single substances. Exposure to hazardous substances, especially endocrine disrupting chemicals (EDCs), during the foetal period is of particular concern, as it can lead to irreversible changes in the development of organs and tissues and increased susceptibility to diseases later in life. The press release below, warns us that we are exposed to a large number of man-made chemicals, creating combinations of chemical mixtures, to which we are exposed during our whole lifespan. The EU Horizon 2020 *EDC-MixRisk project (https://edcmixrisk.ki.se/), which has now reached its conclusion, was initiated to investigate how effects caused by real-life relevant mixtures could be studied. The project, composed by researchers from several Swedish, European and one U.S. university, developed a novel approach based on identifying and testing EDC mixtures associated with adverse health outcomes in humans. By using epidemiology data from the Swedish pregnancy cohort SELMA (a cohort of more than 2300 pregnant women), reference mixtures were created to mimic real life exposures (at concentrations found in the pregnant women). These mixtures were tested in various experimental (cell and animal) models, and the toxicological data from these tests were used to establish new methods and strategies for mixture risk assessment in order to better account for complex environmental exposures. Professor Åke Bergman, coordinator of the project, says “the novel whole mixture approach applied in EDC-MixRisk has allowed us to assess the number of mothers in the SELMA cohort that are at risk for effects in their children, effects related to growth and metabolism, neurodevelopment and sexual development”. In Paris, the team of Prof. Demeneix investigated whether the mixtures interfered with brain development and growth through modulation of thyroid hormone signalling. Prof. Demeneix underlines that “Thyroid hormone is essential for brain development and children born to mothers that have insufficient thyroid hormone also have increased risk of autism spectrum disorder and IQ loss. EDC-MixRisk launched a Policy Brief on Tuesday March 26th which included key results and overarching conclusions and future needs as well as some further project highlights as part of the workshop entitled ' The Chemical Cocktail Challenge', which was held at Thon Hotel EU, Brussels. The workshop is organized jointly with the EuroMix project, highlighting the main results and conclusions from the two H2020-funded projects, EDC-MixRisk and EuroMix, and their implications for future needs for chemical mixture risk assessment.